Whenever I finish a yoga class, I feel calmer, more relaxed. Having the benefit of centering, breathing, balancing and stretching, life seems so much more manageable. I’ve thought so many times how I just wish I had started yoga when I was younger. So I decided I would try to bring yoga into my daughters’ schools. I starting by reaching out to a local kids yoga instructor who was willing to run a family yoga workshop in the evening at the school so families could practice together. That way, we could introduce some of the amazing benefits of yoga, while also creating a family bonding and community event. 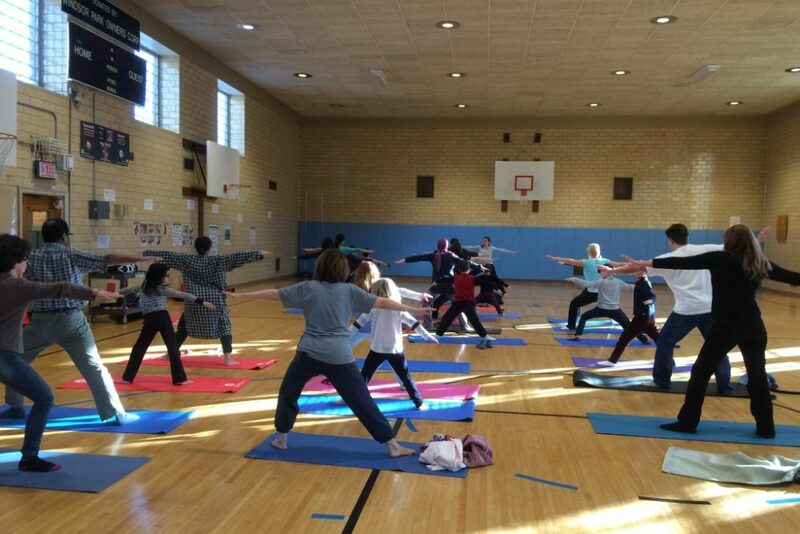 I was very lucky to find Melissa Pereira, also a School Counselor, who has now run Family Yoga events at several local schools in Queens. The feedback has been wonderful! Discuss with school administration what time might work best. One option is the evening to accommodate working parents’ schedules. An alternative is right after school, maybe on the Tuesday parent engagement slot at around 3 pm, so younger kids can more easily attend. Think about which time might get better a response from your school. For an instructor, feel free to reach out to Melissa if you’re in Queens. Otherwise, reach out to your local yoga studios to see if there is a kids’ yoga instructor who would be willing to run a class. In yoga training, there is a special certification for kids yoga, so the instructor may be willing to do the event free or for a reasonable fee to promote wellness (and their classes of course!). Maybe ask if they can arrange for a substitute in case they get sick. You don’t want to have to cancel your event. Mats. Many yoga studios have loaner mats, or store mats for students that get abandoned. Ask your local studio if there are any mats they are willing to donate or loan to the school for your event. Ask participants to bring their own if they have them. Ask the instructor what support they need. Do they need a speaker? Sound system? Microphone? Lighting preferences? Make sure these are in place for the event. While these can be PTA or school-sponsored events, they can also be great fundraising opportunities. Charge a fee per person to use for your school, or donate to another worthy cause. Sell healthy snacks to supplement funds raised at the event. In promoting the event, highlight the value yoga has to relaxation and focus. These techniques can help with stress — and test-taking too! See attached article in the NY Post. Yoga is not just an exercise, it has strong mental benefits as well. On the day of the event, set up some mats, and have some waiting at the door, which participants can grab as needed. Ask participants to roll mats up at the end. The need for volunteers should be minimal.